The Laurentian Great Lakes were formed nearly 20,000 years ago when the earth's climate warmed and the last glacial continental ice sheet retreated. The glacier, up to 2 miles thick, was so heavy and powerful it gouged out the earth's surface to create the lake basins. Meltwater from the retreating glacier filled the newly created basins. 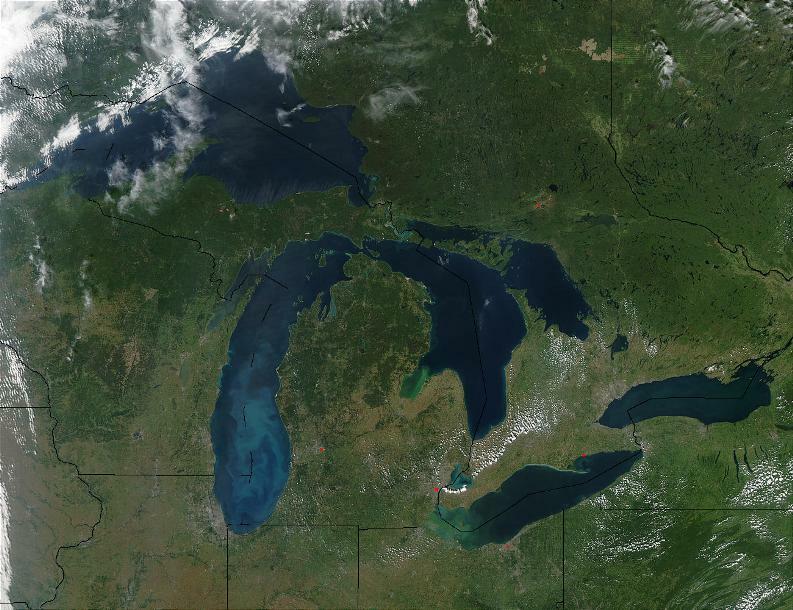 Approximately 3,500-4,000 years ago, the Great Lakes attained their modern levels and area. Water Surface Area: 95,000 square miles (245,759 square km). Largest surface area of freshwater in the world. Shoreline Length: 10,210 miles (17,017 km). $4 billion sports fishery industry. Provides drinking water for 40 million people. Provides 56 billion gallons of water per day for municipal, agricultural, and industrial use. Commercial shipping of 200 million tons over 1,270 mile route. Provides power generation and cooling water. Produces 90% of iron ore. 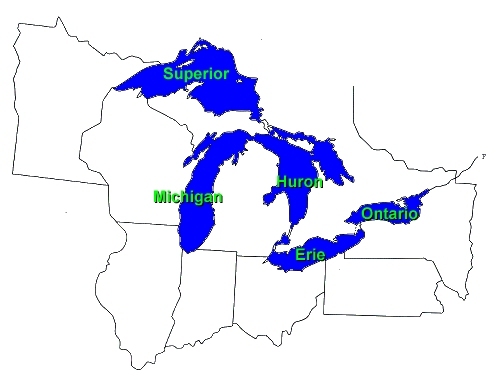 The Great Lakes - Superior, Michigan, Huron, Erie and Ontario - are a dominant part of the physical and cultural heritage of North America. Shared with Canada and spanning more than 750 miles (1,200 kilometers) from west to east, these vast inland freshwater seas have provided water for consumption, transportation, power, recreation and a host of other uses. 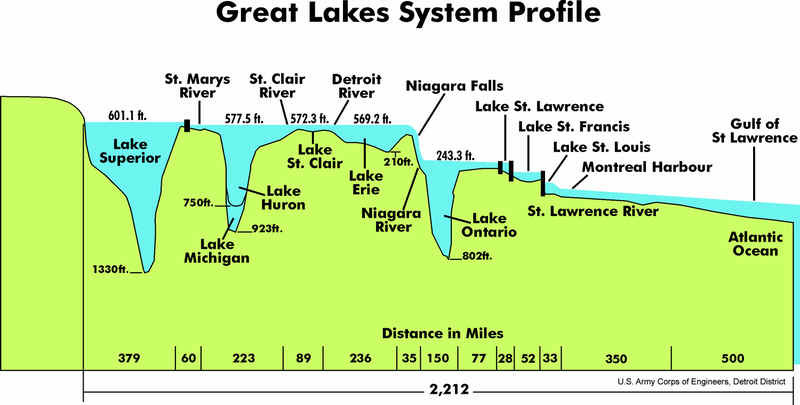 The Great Lakes are the largest surface freshwater system on the Earth. They contain about 84 percent of North America's surface fresh water and about 21 percent of the world's supply. Only the polar ice caps contain more fresh water. Lake Superior is 1,335 feet deep and 350 miles long. 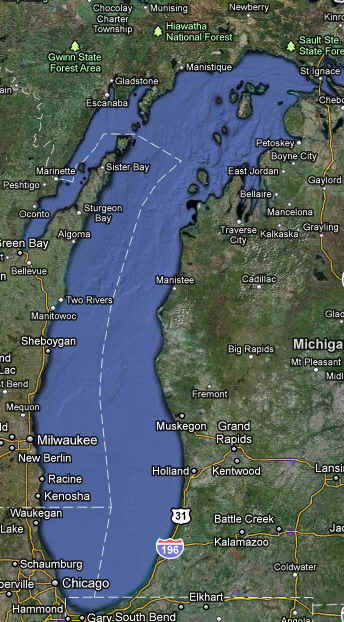 It is the largest of the Great Lakes in both surface area and volume. Lake Superior is the largest in terms of volume. It is also the deepest and coldest of the five. Because of its size, Superior has a retention time of 191 years. Retention time is a measure based on the volume of water in the lake and the mean rate of outflow. Most of the Superior basin is forested, with little agriculture because of a cool climate and poor soils. The forests and sparse population result in relatively few pollutants entering Lake Superior, except through airborne transport.